Oracle: does PARALLEL_DEGREE_LIMIT really limit the DOP? Understanding Oracle Parallel Execution in 11.2 is a pain, not because the topic itself is overly complex, rather because Oracle made it much more complicated than it needed to be. Basically, the main initialization parameter that controls the parallel execution is PARALLEL_DEGREE_POLICY. MANUAL: Disables automatic degree of parallelism, statement queuing, and in-memory parallel execution. This reverts the behaviour of parallel execution to what it was prior to Oracle Database 11g Release 2 (11.2). This is the default. LIMITED: Enables automatic degree of parallelism for some statements but statement queuing and in-memory Parallel Execution are disabled. Automatic degree of parallelism is only applied to those statements that access tables or indexes decorated explicitly with the PARALLEL clause. Tables and indexes that have a degree of parallelism specified will use that degree of parallelism. Using the manual degree policy means that tables and indexes decorated with the PARALLEL clause are accessed using the DOP specified on the object (either default or explicit). The default DOP is CPU_COUNT * PARALLEL_THREADS_PER_CPU. When a query gets parallelized, the physical access plan is sliced into separate threads, called parallel slaves, that, in turn, consume a parallel server each. When all the parallel servers are exhausted (or there are less parallel servers available than the ones requested) the queries start getting downgraded to a lower DOP. This means that Oracle will choose the appropriate DOP to access tables and indexes, based on the size of the objects to read and on the HW resources in the system. Appropriate could also mean 1 (no parallel execution), but, if your tables are quite big, “appropriate” will typically mean default. Setting this option will also mean that the queries will not be downgraded, but they get queued until all the requested parallel servers are available. This allows complex queries that highly benefit from a parallel plan to execute using all the available resources, but also means that the execution times for the same statement can vary a lot between different runs. Another interesting feature activated by this setting is the in-memory parallel execution. When using the MANUAL setting, data is read directly from disk and not from the buffer cache. That makes sense, because it does not generate buffer cache latch contention and also because typically parallelism kicks in when scanning big tables that wouldn’t fit in the buffer cache anyway. However, nowadays server machines are packed with lots of RAM and seeing databases that fit entirely in the buffer cache is not so uncommon. The AUTO degree policy enables reading data blocks directly from the buffer cache when appropriate, which could turn into a great performance enhancement. The third option was probably meant to be a mix of the first two, but turns out to be the “child of a lesser god”, with a poor, half-backed implementation. The idea behind is to limit the maximum degree of parallelism allowed for a query, using the PARALLEL_DEGREE_LIMIT initialization parameter, that can be set to a numeric value or left to the default (CPU). Moreover, both statement queuing and in-memory parallel execution are disabled, and the automatic DOP is used only when accessing tables explicitly decorated with the PARALLEL clause. What is really confusing is the scope of the degree limit, which is described very poorly in the documentation. The “automatic DOP” is a plan scoped attribute and it is turned on only when at least one of the tables accessed by the query is decorated explicitly with the PARALLEL clause. With “PARALLEL”, Oracle means PARALLEL (DEGREE DEFAULT) and not a fixed DOP. When all the tables in the query are decorated with a fixed degree, the automatic DOP is turned off and the limit gets totally ignored. Under these circumstances, each table is accessed using the DOP it is decorated with, which could be higher or lower than the degree limit. When at least one of the tables in the query is decorated with a default degree, the automatic DOP is turned on and the degree of parallelism will be capped by the PARALLEL_DEGREE_LIMIT. According to Oracle, all tables decorated with an explicit DOP should use that degree of parallelism, but it is not so: when the automatic DOP kicks in, it is always limited by the degree limit, even when accessing a table with a higher explicit DOP. Let’s try to demonstrate this odd behaviour. It’s a virtual machine with 4 cores and the instance is configured to use 2 threads per CPU. With this setup, the default DOP is 8. PARALLEL_DEGREE_POLICY is set to “LIMITED” and PARALLEL_DEGREE_LIMIT is set to 4. Both initialization parameters can be set at session scope. Now that we have a couple of test tables, we can use them to see how they get accessed by queries. As a first attempt, we set the limit to ‘CPU’, which means the default DOP (8 in this particular setup). Oracle decided to access the tables using a DOP 7. In fact, no surprises here: we get an allocation height of 4 due to the degree limit. What would happen if we set a fixed degree of parallelism on the tables? Once again, no surprises: the degree limit gets ignored because both tables are decorated with an explicit fixed DOP. However, the true reason behind this behaviour is not the explicit DOP on the tables, but the fact that no other table in the query uses a default DOP. The reason for this is that the degree limit is enforced only when the automatic DOP kicks in, which happens only when at least one table in the query is decorated with the PARALLEL(DEGREE DEFAULT) clause. This is really annoying, because the DOP defined on a table does not determine the real DOP used to access that table, which instead is determined by the DOP defined on another table. This makes the query optimizer behave in a totally unpredictable manner: you get manual DOP when all tables use a fixed parallel clause and you get limited DOP when at least one table uses the parallel default clause. The only way to really limit the parallelism on all tables is to use the resource manager. I filed a bug with Oracle support a long time ago and their feedback is, as usual, disappointing. 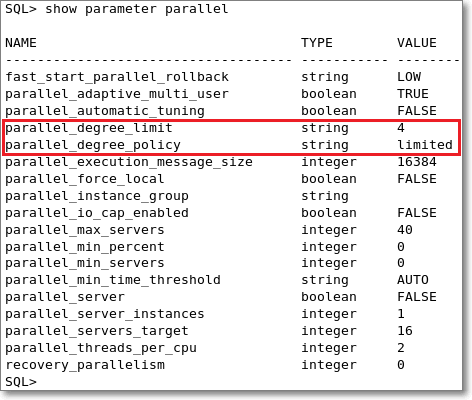 Oracle provides three different policies for parallelism: AUTO, MANUAL and LIMITED. AUTO and MANUAL have their upsides and downsides, but both reflect the behaviour described in the documentation. LIMITED is a mix of AUTO and MANUAL, but behaves in a very strange and undocumented way and I suggest avoiding it, unless you reset all tables to PARALLEL(DEGREE DEFAULT). Posted on July 20, 2011, in Oracle and tagged Oracle, parallel execution, parallel_degree_limit, parallel_degree_policy. Bookmark the permalink. 7 Comments. I was wondering if the behavior described in this article is true also true for PARALLEL_DEGREE_POLICY = ”AUTO’ or it is true only for ‘LIMITED’ ? Will changing one of the table to DEFAULT DEGREE help to get the parallelism on 8 ? Honestly, I have no idea, but I think it would be consistent with the way Oracle intends parallelism. I haven’t worked much with Oracle in the last few years (my focus is 100% on SQL Server now) and I don’t have an Oracle instance around to test. I think it would be fairly simple to test: just change the table DOP to DEFAULT and see what happens. Thanks for sharing such a useful info. How i m struggling to figure out if suppose there is a need to Configure parallelism of PROD1 (oracle 11g) maximum slaves should be 100 and 10% salves should be ready/available. Any thoughts how to achieve this? without using any GUI tool. Another query :- Queries should run on parallel if resources are available and if resources are not available queries should abort. (In oracle). Regarding 10% of slaves available, I don’t think there’s any way to do that. But the real question is: what are you trying to do? Is your goal to achieve more concurrency? Then you need to lower your PARALLEL on objects or with the resource manager. Regarding failing queries if not enough parallel slaves are available, again, I don’t think that’s possible. The default behaviour in AUTO mode is to queue the execution of queries that require more parallel slaves than available. I think this is the closest thing to what you’re after.